In August 2007, Apple’s iWork productivity suite gained a new stablemate—Numbers, a new take on the traditional spreadsheet application. In our review of Numbers ’08, we found it to be easy to use with an elegant interface, but suffering from some limited graphing options, slow speed with large spreadsheets, and lack of AppleScript support. 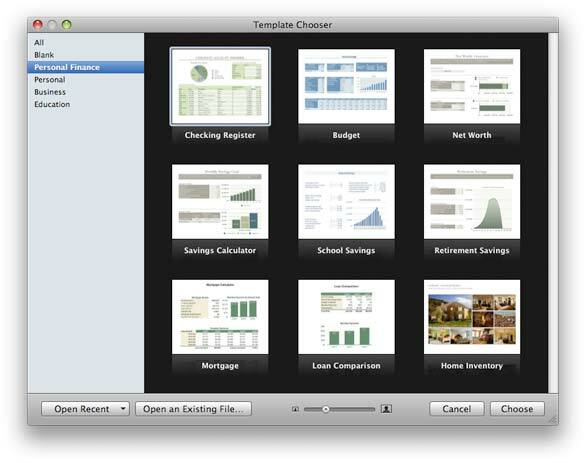 Tuesday’s release of iWork ‘09 jumps Numbers’ version number up to 2.0, and brings a slew of new features to Apple’s alternative to Microsoft Excel. The first thing you’ll notice when launching Numbers ’09 is that the template chooser is now displayed against a pitch black background, instead of the prior version’s neutral gray. Once your eyes adjust to this bold change, you’ll find that there are 12 new templates to pick from, including nine in a brand-new Personal Finance category. These new templates cover everything from budgeting to net worth to tracking your weight loss. Also new in the theme chooser is a simple theme preview function—as you mouse over each image in the theme chooser, you’ll see samples of the theme’s spreadsheet and chart layout. One of the features that I found difficult to use in Numbers ’08 was the formula creation tool. When you inserted a formula using the tool, it would be inserted with word placeholders, as in =DATE(year, month, day). You would then have to erase the word placeholders before entering a value (cell pointer or fixed value). In the new version of Numbers, the variables in the formula appear in colored circles, as seen in the image at right. To replace a variable with a value or cell reference, click once on the variable to make it active, then either type a value or click in a cell on the table to insert a cell reference. This makes formula entry much simpler—which is a good thing, as Numbers now has over 250 functions to choose from. There’s also a very convenient Formula List button on the toolbar that will display every function on your tables. For each function, you can see its location, results, and formula. You can even search this list, and do find-and-replace operations on the formulas. Charting, one of the areas called out in our initial review, is greatly improved in Numbers 2.0. There’s a new mixed chart format that allows you to overlay one data set on another in the same graph (i.e. a line graph on a bar chart), as well as a two-axis chart for graphing data with differing units and/or scales on one graph. You could, for instance, plot both rainfall amounts and wind speed over time on one graph, with differing axes for each data set. Scientists and financial types will welcome the ability to add trend lines (using one of six different fitting equations) and error bars (positive, negative, or both, using four pre-defined types or your own custom settings) to their graphs—this was a key shortcoming of charts in the 1.0 version of Numbers. 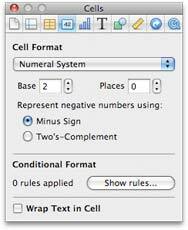 While Numbers still doesn’t support pivot tables, a common method of working with tabular data available in most every other mainstream spreadsheet application, Numbers ’09 adds a feature Apple calls Table Categories. Table Categories provide much of the power of pivot tables, while bypassing most of the complexity of setting up pivot tables. You can create categories and sub-categories for your columnar data (group by state, then by product type), and easily reorder the tables (group by product type first, then state) with a couple of mouse clicks. Another welcome change in Numbers ’09 is the ability to link live Numbers’ charts in Pages and Keynote documents—a linked chart can be updated with a simple button click (though the process is manual, not automatic). Unfortunately, you can’t embed raw tabular data, just charts. Finally, AppleScript support has been added, so you can now do things like (for example) take the selection from a Numbers table and turn it into a Keynote bullet slide, all via AppleScript. Beyond these major changes, there are other subtle improvements in Numbers. There are two interesting new number formats for worskheet cells: Duration for time-spanning values, and Numeral System, which lets you switch from the usual decimal (base 10) to any other, such as binary (base 2) or octal (base 8). Cells can now also have custom display formats, in addition to the formats provided by Numbers. You can also create a password for a spreadsheet that users will be required to enter before opening the sheet, and there are more sheet features, such as freezing rows and columns, and filling up and left in addition to down and right. Finally, like the rest of the iWork suite, Numbers ’09 includes integration with the beta of Apple’s iWork.com web-based application—but we’ll have more to say on that in a future article. Numbers ’09 offers a number of useful new features, and addresses some area of concern we had in our initial review. Stay tuned for additional first looks at the rest of iWork ’09, as well as a full review of the Numbers to see how well the new version actually works.